My situation was one which may easily be described as midlife crisis. No more job satisfaction, raising of family, or any deep sense of fulfillment to replace an active and exciting career and the ardor of single parenting. Having experienced great burnout and total workaholism as the downside of my journey, I was certainly in no position to objectively put form to the next phase of my life. 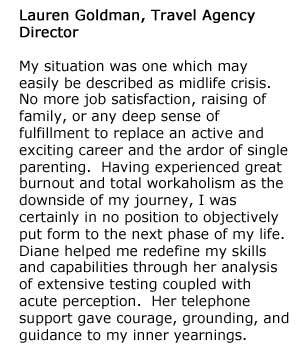 Diane helped me redefine my skills and capabilities through her analysis of extensive testing coupled with acute perception. Her telephone support gave courage, grounding, and guidance to my inner yearnings.